We just purchased this as an open box item from Warehouse Deals. It arrived in great shape, as described. It is a simple, elegant looking lamp, which we used as a vanity light in our guest bathroom. The build is very good, the finish looks great, and the frosted glass is very well done, not the cheap looking stuff you often see nowadays. My husband had never installed a wired lamp before, but was able to put this up without a hitch, using the wiring and light box for the previous fixture. 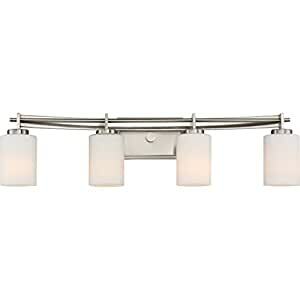 We bought different sconces from another company for the master bath at the same time, and they were nowhere near as well built as these. Once installed, the lamp looks classic and lovely, adding subtle flair to our bathroom. For bulbs, we bought Philips 60 Watt Equivalent 9.5 Watts A19 LED Light Bulb, Dimmable, Warm Glow, Suitable for Damp Locations, 3-Pack (at H0ME DEP0T, about $6 for 4-pack sale price available until end of this year), and they are just wonderful. Soft, comfortable light at lower color temperature without harsh blue tones, and energy efficiency of LED. I don’t have the lamp on a dimmer, so I can’t say how well that feature works. I have been an LED holdout until now, but these bulbs just converted me. This is a 60-watt max lamp, so total is just 120 watt, which is fine for us, as we don’t like excessively bright light, but keep that in mind if you prefer stronger lighting in the bathroom. Bought these for our bathroom and love them! SO gorgeous!! High quality fixture which we hung lights down. We purchased from this mfg before so know their quality. Dimable with incandescent or LED. Pricey, but nice looking, and well made. Nice quality fixture. We put in our guest bathroom and liked it so much, we got 2 more for our master bath. Gives bright light with the white glass shades. This fixture is made very well and matches with oil rubbed bronze fixtures.